So I'm unearthing myself from a hole of work, vacation, Game of Thrones (the books), and life in general to promote the heck out of a friend and fellow writer, Julie Frayn. 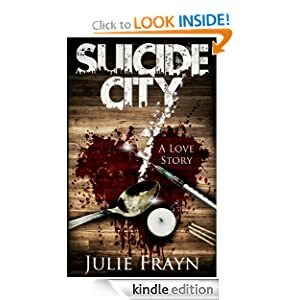 Go get her book Suicide City, A Love Story. I'm incredibly proud to call her my critique partner and to have had the pleasure and honor to read her work and have her read mine, wallow in the difficulty of publishing, and dream of one day being a published writer. Well Julie, you've done it! I'm so proud of you. Any indie writers out there who feel like helping to promote a talented writer, please go forth and do so! I hope someday I can find courage enough to follow in her footsteps. And by the way, I love the cover! Sounds like you've been ridonkulously busy! Looks like an interesting book! Off to grab the sample... WRITE ON!